Created in 2000, Magellan Vacations is a luxury hotel booking company catering to discerning travelers looking for personalized recommendations about the location, view, and overall comfort of each hotel room. It works exclusively with four- and five-star properties in core destinations like Los Angeles, Miami, and New York City, and instead of booking online, customers discuss their options with highly trained booking agents who have actually stayed in the rooms and can give first-hand feedback over the phone. The company employs 75 people, encompassing a bookings, marketing, and IT team. While focusing on phone bookings creates a more personalized experience, it also makes tracking typical sales metrics more of a challenge. Sisense was brought in to transform this complex, often disjointed data into engaging, real-time dashboards to help Magellan maintain a competitive edge, while catering to a niche market. We wanted a solution that would solve real-time requirements of the sales floor…Sisense can handle that kind of data problem, slicing and dicing information to provide the best visualization. Plus, end users can create the reports themselves. and won’t slow existing infrastructure as reports are generated. Complicating matters, Magellan Vacation’s personalized, phone-based service meant that standard sales metrics like closing rates, commissions, and bookings by destination were harder to record and track automatically. To help the company handle its large, complex and often unstructured pools of data, the team were already trialing a leading in-memory technology – but the software’s performance was sub-par. It required specialist IT resources to work with the tool proprietary scripts, as well as consultants to work with and modify the application. Put simply, this tool wasn’t living up to their needs. Before trying out Sisense, Magellan Vacations had experimented with a number of other tools to wrangle its data. In each case, the company had run into usability, cost, or infrastructure challenges. For example, to continue using the tool it had deployed prior to Sisense, the company would have needed to outsource reporting (at high cost) and hire a new IT staff member, to the tune of $80,000 per year… on top of the cost of the software itself. Then, Vignuzzi discovered Sisense, which offered precisely what he and his team were looking for: a near real-time dashboard that didn’t bog down the company’s servers, no matter how many data sources it accessed, and a solution intuitive enough to allow non-technical users to create their own reports. Vignuzzi quickly found that Sisense can handle any volume of data, across any number of data sets, with a lightning-fast query speed. Users didn’t need any SQL knowledge, while marketing and operations became much more engaged in the reporting process. Overall, Sisense promised to reduce the burden on IT, while offering a lower total cost of ownership than any other solution they had tried. Since deploying Sisense, Magellan Vacations says that their IT department has reclaimed significant amounts of time – they no longer need to step in to create reports on their colleagues’ behalf, since the platform is so user-friendly. 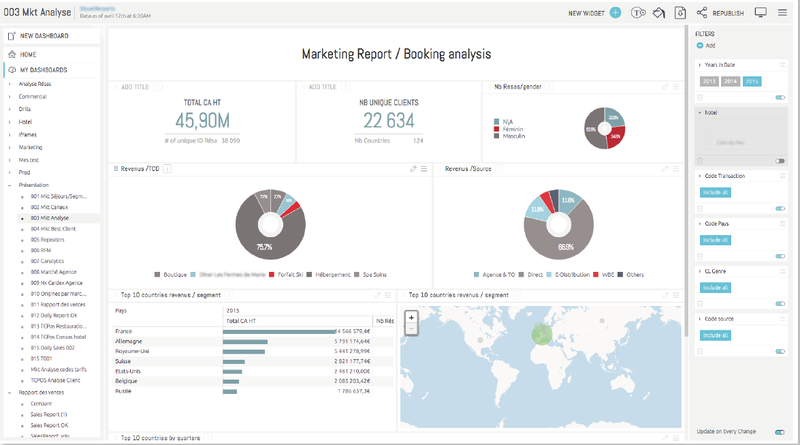 Meanwhile, the tool provides booking agents with near real-time feedback, and gives team leads an invaluable, data-led asset for coaching and counseling agents to meet their sales goals. The benefits are felt across the rest of the company, too. Users can call up reports immediately instead of waiting for a published report. Data can be manipulated on the fly, allowing them to drill down via their dashboards – giving a clear insight into what’s working and how each person or team is performing, at speed. Going forward, Magellan Vacations expects to use Sisense to enhance more and more of its activities as the company grows and its data environment matures. Using Sisense, the teams are able to stay ahead of the curve, making smart business decisions that improve productivity, efficiency and sales growth behind the scenes – without sacrificing the level of customer care and individual attention that has made them a success in their niche. The travel industry is highly competitive and the fact that we glean insights in real-time across marketing, sales, and operations is a key strength for us.